EVENT DETAILS Welcome and invited to second round of Crowdfunding workshops, organized by the project lead partner E-zavod in cooperation with Slovenia Crowdfunding Meetups. The main topic of this workshop is INTELLECTUAL PROPERTY. EVENT DETAILS Myths and facts. Is mining of cryptocurrencies sustainable? How much energy does mining consume? Will the energy consumption grow in the future, or is it going to decrease? Is it possible for currencies to be eco-friendly? What are the alternatives to the Proof-of-Work algorithm? Speakers: Marek Môcik (President of Blockchain Slovakia) @Anambroid (Twitter crypto influencer Attendance is free, but the capacity is limited. Please reserve your ticket via eventbrite. EVENT DETAILS The second workshop for SMEs in Croatia will take place on February 3rd 2018 in Zagreb, Croatia. 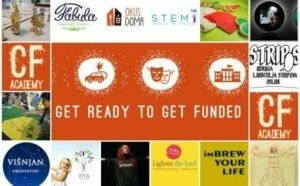 It will mainly host designers who want to know the basics of crowdfunding, since it is organized with a help of Croatian Designers Association (HDD). More information about the event can be at HDD’s official website (Croatian language). You can also find the event on Facebook.